A Torero running with the bulls has been an annual event in various countries where bullfighting is seen as a sport. 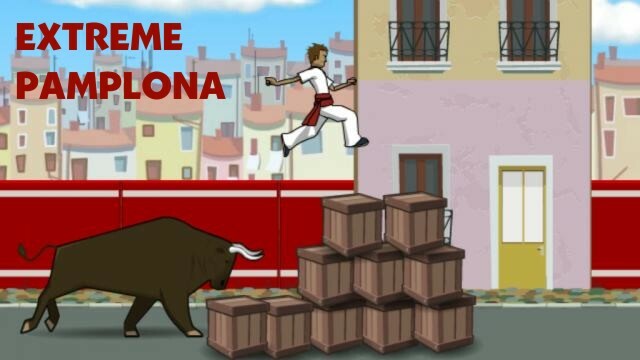 Extreme Pamplona is a flash game where your platforming skills will be put to the test as you will play as a Torero running away from not only a bull, but also characters that take on the role of the bull. The game was created to sustain the advertising campaign of “Sure Men” deodorant for the ‘Running of the Bulls’ event in the Spanish town of Pamplona, yet as it was first launched on Miniclip website back in 2007 it gained a massive amount of successalmost instantly as in the first 20 minutes of it’s launch the number of plays reached 100.000 times. The main objective in Extreme Pamplona is to successfully escape the clutches of your pursuer and enter the end goal of each level. 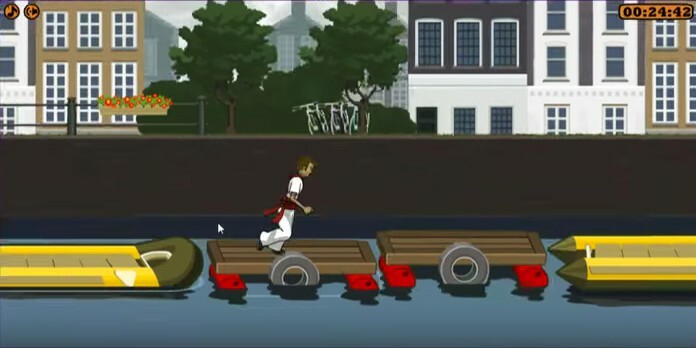 The gameplay mechanics of Extreme Pamplona are very simple as you will press the left and right arrow keys to run and either the up arrow key or Spacebar to jump. The game encourages you to stay on the run because your pursuer will never let up in chasing you. Sometimes you can get away with taking a short break from running as your pursuer will occasionally get stuck in a wall. This isn’t really a glitch, but rather a feature purposely implemented. While you will start in Spain for Level 1, the level format will branch out from Spain to Germany and the Netherlands, and then these levels will branch out to the United Kingdom, Switzerland and France. From these levels you will be taken to either Russia or Sweden, and then you wrap things up back in Spain as the final level. Each level will be designed differently, meaning that you will not always have the same setup when it comes to obstacles. In Spain you will be running with other Toreros in some spots, and when you get caught in this crowd of Toreros you will be forced to slow down for just a second. This adds an interesting element to the first level. When progressing through each level you will be given flashes of the parkour style of platforming as you will need to make bold jumps to reach small platforms. Not only are the placement of obstacles different in each level, but the animation and appearances of each level is different. Each level captures the feeling of the countries that are featured. In the Germany level you will have to jump over beer kegs and run away from a German waitress who will offer you a mug of beer. In the United Kingdom level you will be chased by a British police officer as you will jump on platforms that are connected to brick buildings. In Russia a soldier wearing a furry hat will be chasing you with his sword, and in France you will be sent to Notre Dame where a guy playing the role of the Hunchback will be chasing you. The music and sound effects of this game are very fitting for the Torero theme. Whether you are in Spain or elsewhere the music gives you that feeling of needing to stay on the run. The sound effects are comedic in how they are presented. 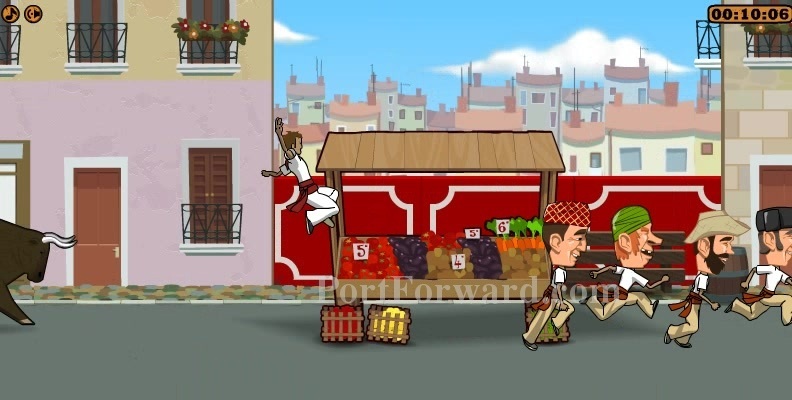 Extreme Pamplona is a game where you can immediately get a feel for all the comedic spots. This game was actually used as part of a promotional campaign for Sure Men Deodorant, so it comes as no surprise that the game would want you to run away from pursuers without breaking a sweat. If you like to play games where you stay on the run and are forced to make split decisions that could either lead you to victory or defeat, then playing Extreme Pamplona would be recommended. This game presents challenges where you have to time your jumps just right or else you will be sent back to earlier parts of a level. The margin for error in the use of platforming in this game is very slim. Extreme Pamplona is a fun game that has controls anyone can get used to.